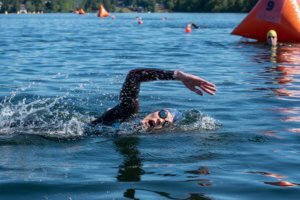 Whether you are an experienced swimmer or an “adult-onset” swimmer, when it comes to open water swimming, everyone needs to practice the same skills to be fully-prepared for racing in the variable conditions of open water. 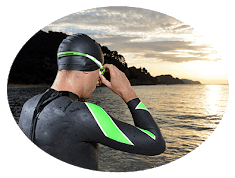 Open water swimming requires a specialized set of physical and mental skills. Those only come with specific open water swim training. Even if you’re a strong pool swimmer, you will have greater success from practicing essential open-water skills. 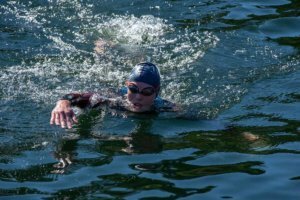 Whether you hire a coach, join an open-water swim training group, or acquire the skills on your own, Coach Rodrigues knows you need to develop adaptation to the specific demands to be successful in an open water triathlon swim. One such demand includes swimming very close, even bumping into, dozens of other athletes. Sometimes the racers start out too fast. Added challenges are sighting to navigate, a spiked heart rate when you exit the water and a taxing run to the transition or finish line. 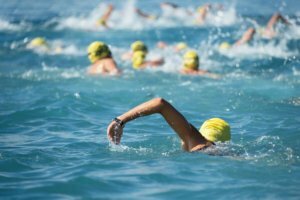 Even if you’re experienced and comfortable in the water, your ability in the pool doesn’t determine your ability to swim in open water, especially when conditions are rough with currents and choppy waves. Train your open water event skills in the pool. Rodrigues advises athletes to build skills in the pool first. Then head to the open water to practice those skills in open water. Unless you are very experienced, don’t just head straight for the beach. Learn to sight. If you haven’t practiced sighting, you won’t swim the shortest distance on course. Often, you’ll lose time, expend extra energy, and increase your stress. Sighting–lifting your head and looking to keep yourself on track, is physically challenging. Proper sighting involves raising your head up to affirm course direction and breathing, according to Rodrigues. A right-sided breather should finish their left arm stroke. Then, as their left hand is coming out of the water and their arm is coming around, they lift their head so that their mouth clears the water just before the left hand re-enters. During the lift, which lasts less than a second, the swimmer’s eyes have spotted what they need to spot before their head turns right to take a breath. For a right-handed breather, sighting is done as the left arm is making its circular return and in the air. Explained from the opposite side, still for the right-hand breather, as the right hand enters the water, you press down slightly for a slight lift, which is occurring as the left hand is exiting the water. Rodrigues recommends practicing sighting in all your main swim sets, and sprinkling sighting throughout your swim workout. Dive in to start your set. Climb out when you’re done and RUN! During race season for open water, Rodrigues says to start your sets by diving into the pool to mimic getting amped up at the beginning of a race, while continuing to incorporate sighting. Here’s a great workout to practice: In a set of 10 x 200’s at 80% effort with 30 seconds rest between intervals, Rodrigues recommends swimming the first 50 fast. That’s because the pack in an open water swim typically goes out faster than in a pool race. Swim the first 50 at 90-95% effort, and site eight times. Swim the middle 100 at 80%, sighting one or two times per 25, then go harder on the last 50, around 85%-90%. Immediately upon touching the wall at the end of your 200, climb out of the pool and run in place for 10 sec to mimic running up the chute. Team Vasa Tip: If you can’t easily get to the open water and are training indoors with a Vasa SwimErg or Vasa Trainer, be sure to make some of your workouts be “swim-to-bike bricks”, whereby you simulate the “swim-to-bike transition” with realistic, deliberate practice. Here’s a video describing how some do it, and you can always add a longer “beach run” between the SwimErg and jumping on your bike trainer by running on a treadmill, up some stairs, around the living room, etc. Be creative! Share a lane with four other people during open water swim. Swim in a crowded pool, ideally without lane lines. Rodrigues tells athletes to do as much race-specific swimming as they can fit into their training programs, including lots of 25s, with three to four people abreast. Do sets with a partner, swimming fewer intervals and more yardage, like 4 x 500’s. The first swimmer starts the set fast with the second swimmer pushing off at the first swimmer’s feet. Every 100 yards, the swimmers switch positions, so the first swimmer gets about two seconds rest. The second swimmer then takes the next hundred out fast with the first swimmer drafting. 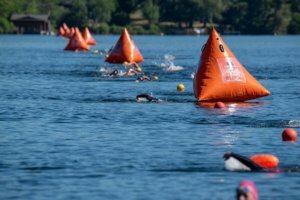 As with any open water swim training, site two to three times per lap if you’re leading, and one to two times per lap if drafting. Rodrigues warns that swimmers who aren’t in the front of the pack should be wary of drafting in a race. If you’re a slower swimmer and you decide to draft, you may end up drafting off someone who has no idea what they’re doing. Only after you’ve developed open water skills in the pool does Rodrigues recommend you take those skills to true open water. Recruit 10 people who are roughly the same speed. Set up a five-minute open-water course, 100 m out, 50 m across, and 100 m back. 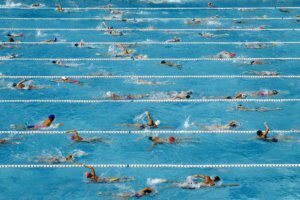 All 10 swimmers should run into the water together to simulate a mass start. When you exit the water, run back to the start point. Repeat the exercise for 30-40 total minutes swimming. “Now we have race-specific ingredients, a bunch of people caught in close quarters at a similar speed,” says Rodrigues. Rodrigues tells swimmers to repeat this drill on at least a dozen different days to be exposed to different wind and water conditions. 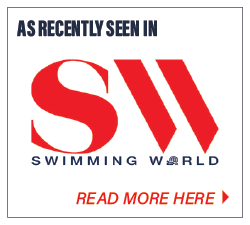 Want an efficient and powerful way to integrate the Vasa SwimErg with open water training? Check out this video for ideas on integrating training on land with key progressions and drills when swimming in the pool or open water. Interval swim training has proven to be more effective than steady state workouts. Here’s what to know to maximize your results. At home swim training might be the key to improving your triathlon performance. Here’s why. It’s hard getting to the pool. When you do, you want to make the most out of your time. Here’s how. Here are 15 more tips for finding the motivation to train when you’re building habits. Subscribe to get this free resource. Here are a few tips for improving your swim training for a better triathlon performance. Subscribe to get this free resource.